Today’s post is slightly different and doesn’t involve any nail designs of my own. It was my birthday last week and 3 nail ladies on Instagram decided to surprise me with a birthday mani they had created! I was so surprised with their thoughtfulness I absolutely had to share it on my blog. Please take some time to browse/follow their nail accounts; @coffeeandnailpolish, @mynailpolish_addiction, @polishandbeyond. Their posts explain the design and which polishes are used. 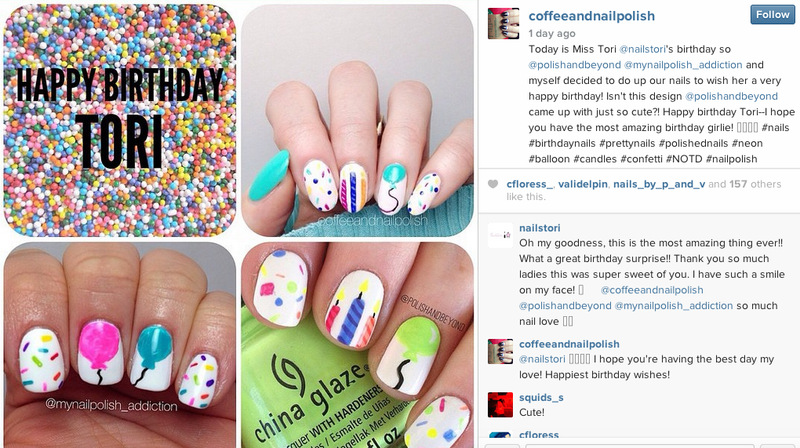 Their birthday surprise reminded me why I love the nail blogging community so much! I have lots to share this week following a big nail mail delivery from HB Beauty Bar!